There are many articles on this site dealing with actions in the Age of Fighting Sail that involved only a few vessels, in many cases two only. In most cases, skilful manoeuvring and sail management, taking full advantage of wind and sea conditions, were key factors in positioning vessels to deliver their broadsides from the most advantageous position. There can only have been few cases in which the action took place in a calm and the movements of sailing warships were determined by the ability of their crews to propel them by sweeps or oars. Sweeps were long oars which could be extended out through gun ports and their use seems to have fallen away in the course of the 18th Century. 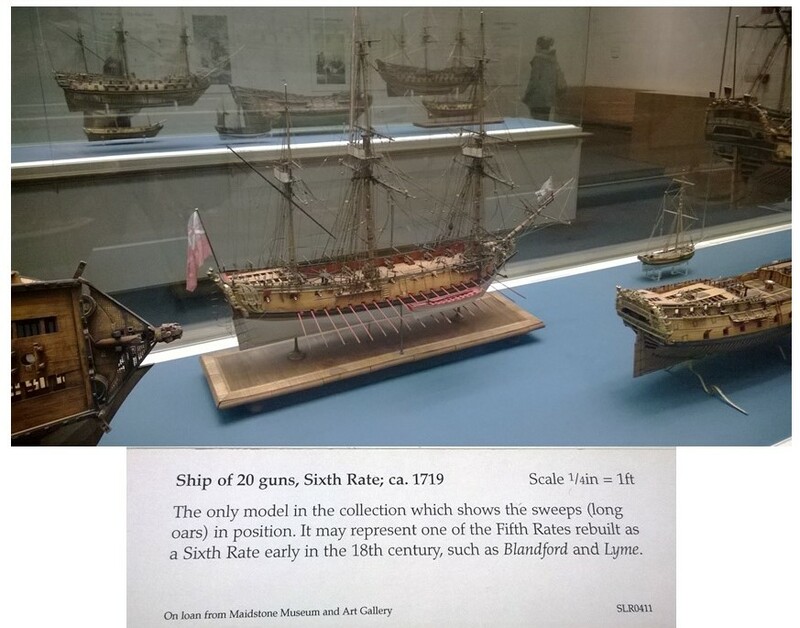 In Britain’s National Maritime Museum in Greenwich there is only one model of a vessel with sweeps deployed, as shown in the photograph below. It was during the War of Austrian Succession in January 1743 that HMS Pulteneyfought a battle in the Straits of Gibraltar in which her sweeps, and her enemies’, were to determine the course of action. The Pulteney, “a large brigantine” carrying 16 carriage guns (I can find no further detail) and commanded by a Captain James Purcell, had been cruising in the Straits to deter Spanish naval movements (as was the case in most in 18th Century wars, Spain was allied with France against Britain). She now however found herself becalmed off the British fortifications at Gibraltar and under observation from Spanish forces at Algeciras, directly across the bay from them. Two Spanish xebecs now left Algeciras to intercept Pulteney. 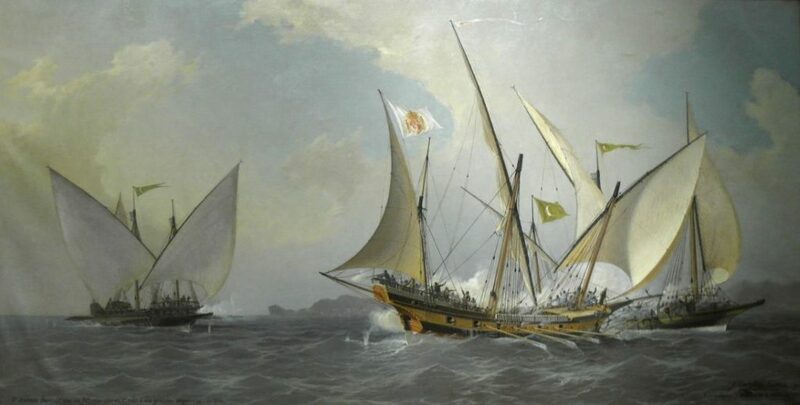 Xebecs were a type of craft common in the Mediterranean and were employed by the Spanish and French navies as well as by North African corsairs. Light and highly manoeuvrable, many were essentially galleys, with provisions as a matter of course for oar propulsion as well as by large lanteen sails. (Sentencing to galley service was a dreaded punishment for criminals). This contrasted with the use of sweeps, which were usually employed as a last resort, and operated by members of the crew. The two xebecs that came out to confront Purcell and the Pulteney were each crewed by 120 men and each carried 12 guns, apparently 9-pounders. Their rowers’ efforts were supplemented by the current through the Straits running in their favour. The Pulteney by contrast had only 42 men on board, three of whom had been wounded in an earlier action. Madrid’s Navy Museum (catalog number: 522). 1902 oil painting by Ángel Cortellini y Sánchez (1858-1912). The xebecs opened fire with individual guns as they approached but when within hailing distance called on Captain Purcell by name to strike so as to avoid unnecessary slaughter. He and the Spanish captains appear to have known each other – this being an era of gentlemanly warfare and courteous respect for the enemy. Purcell, as was probably expected, refused to yield and the engagement commenced, the Pulteneybeing at a disadvantage to her more manoeuvrable foes. Gunfire was exchanged for an hour and three quarters and the Spanish xebecs made three separate attempts to board. Given how small Purcell’s crew was it is improbable that all 16 of Pulteney’s guns could have been manned but they at last inflicted sufficient damage to the xebecs that they broke off the action to head for home. Even now, Pulteney attempted to chase them, with the Pulteney now propelled by her sweeps since there was still no wind. The lighter xebecs managed however to make their escape. The Pulteney had suffered seriously, her sails and rigging completely destroyed and her hull and masts damaged. The action had occurred in full view of the Gibraltar garrison and boats went out to tow her back to safety. Her crew had suffered one dead and five seriously wounded but it was reported afterwards that the clothes of every man on board had been rent by shot or fragments. A subscription was raised by Gibraltar’s governor, officers and merchants to present Purcell with a piece of plate while money was distributed to the crew. Purcell’s and Pulteney’s heroic stand was the type of incident that was to inspire so much naval fiction in later years.